Whenever you post any article on blogger, it automatically shows up author name along with labels under the post titles. or at the very end of your post depending upon your blogger template. We have seen many newbies who want to hide author name to protect their privacy and even labels from their blogger post to make their blog look more professional. 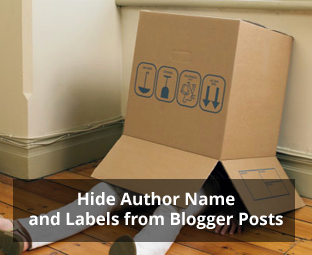 Today in this article, we will show you how to hide author name and labels from blogger posts. So, here are the steps which you need to follow, so that you can easily hide the author name and labels from Blogger posts. We have divided this article into two sections so that you can easily grasp the idea and method. First of all, go to Blogger and select your blog. After that, press Ctrl+F and search for the ending </head> tag. Ones you found </head> tag then simply paste the following code above the ending </head> tag. Save your blogger template and it will hide labels from your Blogger posts. This was our article which has made you learn to hide author name and labels from blogger posts. We are sure you guys must have availed from this article. If you have any queries or confusions left related to this article then lend them in comment box. Any of our team members will assist you in solving them. Was it interesting? If it was then don’t forget to share this article with your other friends and circle too. You may never know that your share may be proven helpful for many of the users out there. So, keep sharing and liking our content over social media. How do you remove the auhor name from the Mobile version? Didn't work on dynamic theme!